When I was a teenager there was a sub shop by our house that made the absolute best chicken cheesesteak subs. I didn’t even know that chicken cheesesteaks existed until I had one from there and I was instantly hooked. I’ve never tried to make a chicken cheesesteak at home before, which is a real shame. I wish I would have found this recipe sooner. Actually, I’m glad I found it when I did since I was able to choose and make it for this month’s Secret Recipe Club. 1. Preheat the oven to 400 degrees. Cut 6 sheets of foil and place on a baking sheet. 2. Heat a large oven-safe skillet over medium-high heat. Add 1 tablespoon of oil. 3. Meanwhile, season the chicken with salt and pepper. Place the chicken in the skillet and sear for 2-3 minutes per side, until golden. 4. Transfer the skillet to the oven and bake for 15 minutes then remove from the oven. Reduce the temperature to 300. 5. Meanwhile, heat butter in a small saucepan. Whisk in flour until the mixture is golden. Slowly pour in the half and half and stir until bubbling. Reduce the heat to low and stir half in the cheddar cheese until melted. 6. Once the chicken has slightly cooled, shred it. 7. Assemble the sandwich by spreading the cheese sauce on both sides of the roll. Top with shredded chicken, lettuce, tomato, mayonnaise, caramelized onions, and then divide the remaining shredded cheese between the subs. 8. Wrap each sub up in the piece of foil, place on the baking sheet, and bake for 5 minutes. I know most people eat cheesesteaks with peppers and onions, which I do enjoy, but here they are most commonly served with lettuce, tomato, caramelized/fried onions and hots. I skipped the hots but went the lettuce and mayo route. I really enjoyed these subs as they were similar to the ones I had as a teenager, but next time I want to try the peppers and onions version. I also didn’t bake my subs for as long as directed in the recipe because baked lettuce and tomato just isn’t that tasty. Those subs look oh so delicious. You must have devoured them in no time flat. Love subs! 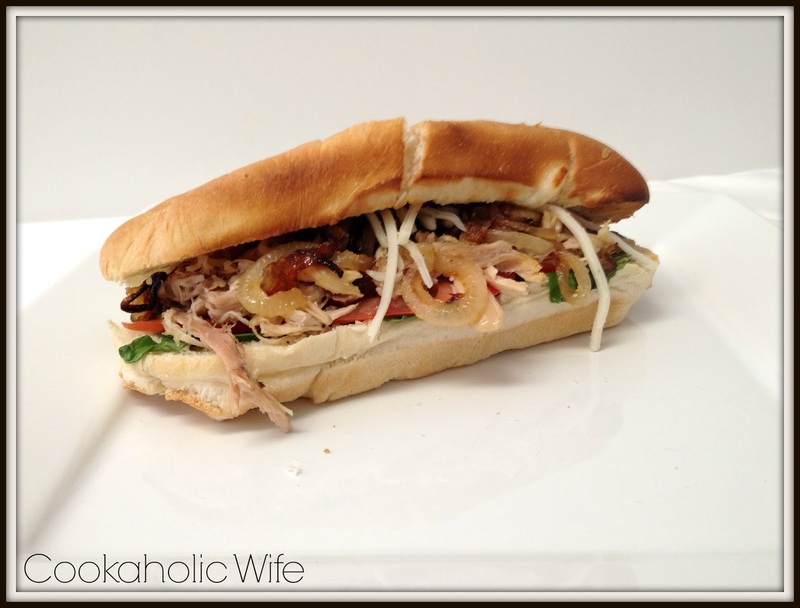 I've never had a chicken cheesesteak and it looks amazingly delish. Yum! What fantastic subs! 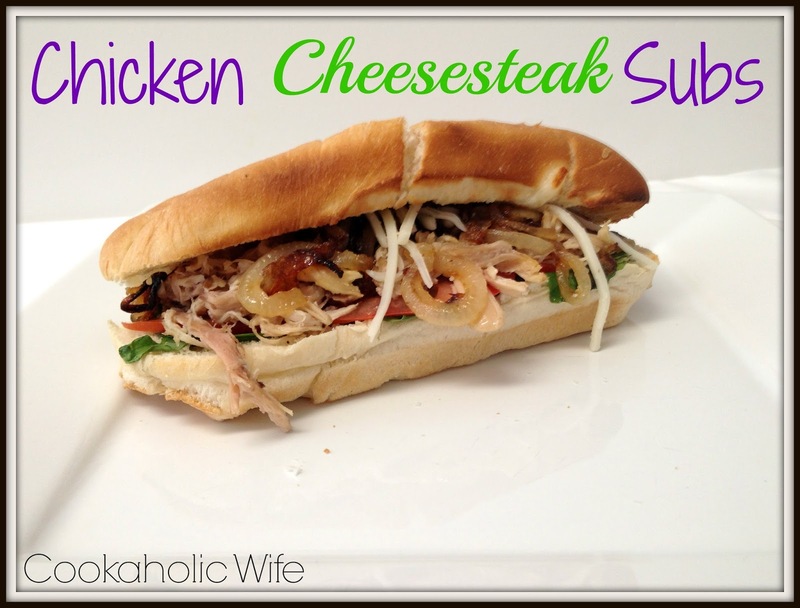 I've never heard of a chicken cheesesteak sub prior to this… on my list of foods to try! I love hearing what food people grew up with, especially when it was never part of my growing up half a world away. I've only just recently heard of chicken cheesesteaks! Ooo – I was so excited to see this! 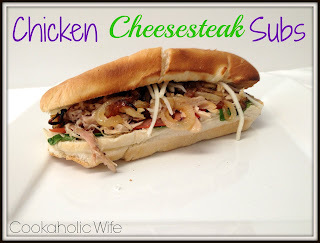 I've been wanting to make chicken cheesesteak subs, but didn't have a recipe. It's such a good, comforting combination – will definitely be trying it this weekend! These look fantastic, I love sandwiches. Every once in awhile you have to disregard calories and enjoy something cheesy. These look well worth the cheese. I love subs and these Chicken Cheesesteak Subs sounds wonderful. definitely love the flavors in them. I've never tried Chicken Cheesesteak subs before. I will definitely add it to my list! Oh I love a a good sub and chicken is just as good as steak. subway should get this recipe!